I want to use something other than Ajax toolkit to pick a date in a textbox. 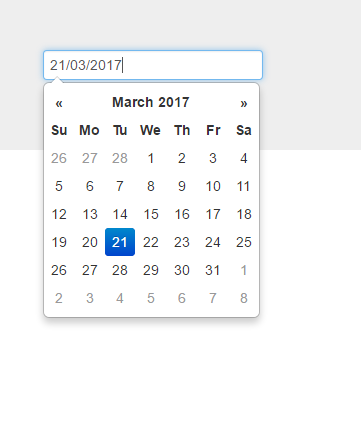 I found something called datepicker in jQuery but not sure how to use it. Below is my TextBox in my edit template of a ListView but I cannot get it to work. Has anyone used this option? If so, what do I need to load/setup in order to use it? Thanks. You can try below code for Bootstrap date picker. Works great, thanks! If I had multiple date TextBoxes on the page how would they be handled in the $(document).ready function? If I had multiple date TextBoxes on the page how would they be handled in the $(document).ready function? The $(document).ready() function runs when the page has loaded. In the example code above $(document).ready() is used to assign the date picker, using a JQuery selector, to all textboxes where the id attribute contains the string "txtToDoDate". So if I wanted all inputs with class containing "idate" I could use below? I would use the JQuery class selector. Please see the (previously posted) JQuery selector documentation for more information on querying the DOM with JQuery selectors.